Organised independently by John Wharton in memory of his father Jack, one of the early pioneers in the preservation movement. This epic two day Road Run by about twelve engines on the first day swelling to more than twenty on the second, was nonetheless the curtain raiser of the Great Dorset 1997. It has become regarded as one of the best ever. Fires were lit at 3am - much scrabbling in the dark! At 6 am they were away. Arranged through beautiful countryside of Wiltshire and Dorset, with an overnight stop at one of the finest Houses in the south and then that spectacular last stage to the Show ! Over £7000 was raised for Cancer Research ! Epic two day Road Run by about twelve engines on the first day, swelling to more than twenty on the second. 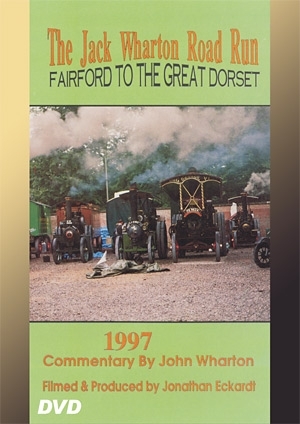 Curtain raiser of the Great Dorset 1997. Fires were lit at 3am. At 6am they were away. Travelling through the beautiful countryside of Wiltshire and Dorset. Over £7000 was raised for Cancer Research!